These wood handcrafted cheese boards are perfect for serving your cheese appetizers. They measure approx. 14" x 6" x 3/4 and are available in Ash, Cherry, Maple, Walnut and a Cherry/Walnut Combination. So many beautiful options for you. Combine with one of our spreaders...these make a perfect gift! Dimensions and wood grain may vary slightly as they are made one by one by hand. 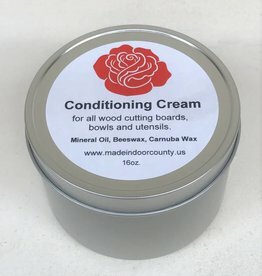 Don't forget our Wood Conditioning Cream to keep your wood products looking fabulous.